HomeBlog January 2015 New FolkArt Home Decor at Jo-Ann Fabric and Craft Stores! New FolkArt Home Decor at Jo-Ann Fabric and Craft Stores! It's even easier to restore your decor using a personal touch with the introduction of our expanded line of FolkArt®‎ Home Decor new colors, sealers, finishes, stencils, tools and brushes now available at select Jo-Ann Fabric and Craft Stores! We love how simple it is to create a crackled effect, distressed or weathered finish using the new line additions! Not sure where to start? Learn how easy chalk painting is in our new book "A Beginner's Guide to Chalk Painting" with project step-by-step photos. The FolkArt®‎ Home Decor Chalk color palette gets better and brighter with 26 new colors! Let vibrant shades of Seaside Villa, Tuscan Red, Metallic Gold and more transform your decor and craft projects with a simple stroke of the brush. Next, to enhance the finish of your projects, pair FolkArt Home Decor Chalk with Varnish to protect heavily used surfaces both indoors and out, or use Crackle effect on wood or over paint. In addition to our Clear and Antiquing Wax, we introduce White Wax. Our FolkArt Home Decor Wood Tint gives beautiful color and design on unfinished wood or an antique effect when used over light colors of FolkArt Home Decor Chalk paint. Pair the tints with Masking to create unique reverse tinted effects. New Stencils make it super easy to DIY your favorite home decor trends, and add a custom touch to any piece. You'll also get easy coverage with our four specialty Brushes to use with our paint and wax, and Tools to recreate special effects like distressing, stripes or weathered finish. 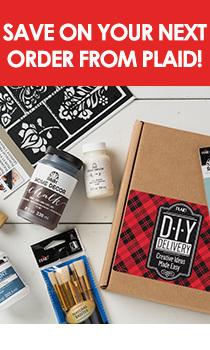 Get more information on FolkArt Home Decor®‎ products, tutorials and tips on our website, and visit Jo-Ann Fabric and Craft Stores for the entire line!